This week on the blog, instead of writing about fitness and fashion, I feel compelled to write about fitness and how it relates to me personally. In sharing this with you it is my hope that you will see exercise and your relationship with your trainer as so much more than just a means to getting into a pair of pants or ready for a family reunion. Life is not always sunshine and roses – you know that. A lifetime of ups and downs can sometimes leave you feeling beaten up and , sad and maybe like you have no sense of control. I know this has been the case for me, but as far as I can look back the one thing that has kept me from giving up has been exercise. In all seriousness, no matter what the crisis was, working out has always made me a stronger person physically and mentally and I always felt better after a workout. I felt so adamant about this that I was always encouraging friends, relatives etc. to use exercise as a tool to not only look better but to feel better. It eventually became clear to me that this was the career for me and frankly, I’m very good at what I do…. because I BELIEVE in what I do. As a trainer I want the best for my clients, I want them to succeed. I leave them feeling great and am happy for them ; high-fives all around! If they are having a bad day, working out with me will be a bright spot because they did something good for themselves and for that hour were in control of their life. When life is chaotic, that bit of control can be just enough to help someone get through the day. In fact, I believe in the exercise-client-trainer relationship so much I hired my own trainer. When I am finished working out with my trainer I feel accomplished, happy and….sweaty!!! All good things! And one of the best realizations is that There is a bond between trainer and client. Each person wants to do the best for the other. An inner strength can pop out of nowhere because you want to do your best and succeed, and that goes for both parties. Working out brings confidence and confidence can get you through a bevy of stressful situations, as I know all too well. Time to get a little personal, and I’m not doing this to generate sympathy, I’m sharing this because my workouts, my trainer and that little slice of control has been THE thing that has helped me to keep my head up. This year has left me with 2 deceased dogs, a loss of a home and, oh yeah, a soon to be ex- husband….he somehow landed at the end of this sentence (wink wink) . I never saw this coming and there were many times I thought “How can I even work and encourage and be enthusiastic for my clients? How can I function without knowing where I will live and what will become of my life?” The truth is that my clients were the reason I got through it! My clients were my biggest supporters who made me feel important and worthy – I was helping them and that in turn helped me. And the decision to move my body every day, even when I didn’t want to get out of bed, helped me to make sense of what was happening. I was able to see the bigger picture. I took my tired self and started hiking again and getting stronger. A fire was lit and I made it work. I can thank my trainer and my clients for that (and of course my wonderful friends and colleagues). This is a work in progress, but I know for a fact that exercise will keep me on the right track. We have all faced adversity and will continue to do so, but the moral of this story is that if you believe in yourself and your abilities, you will be able to conquer the obstacles and that the best medicine is to take care of yourself by moving your body every single day. When you have a trainer in your corner you know that there is always going to be someone who does believe in you. When life is hitting you hard don’t run in the other direction, instead run through the obstacles! Keep moving and your head will clear and you will be able to make decisions. Speaking of running, we will talk sports bras soon !! HA And don’t forget to high-five your trainer!!! Be sure to connect with us! This entry was posted in Active, attitude, belief, Clients, Conditioning, core conditioning, Exercise, Fitness, Health, mens health, Personal training, Weight training, wellbeing, Wellness, womens health and tagged active, active lifestyles, activity, attiutude, belief, clients, commitment, conditioning, fitness, friendship, guidance, health, health and fitness, personal training, resolve, support, wellbeing, wellness on September 2, 2015 by FitnessPropelled. 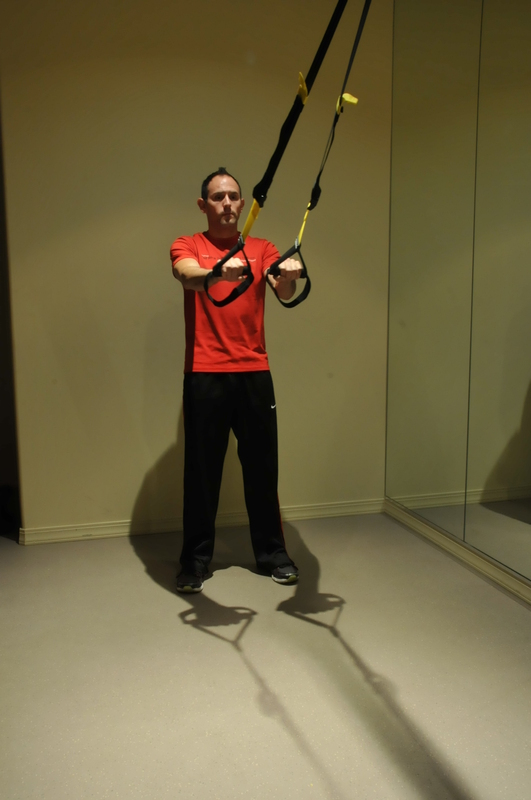 Understanding what exactly is a TRX?, would be critical before attempting its’ exercises or passive range of motion stretches. 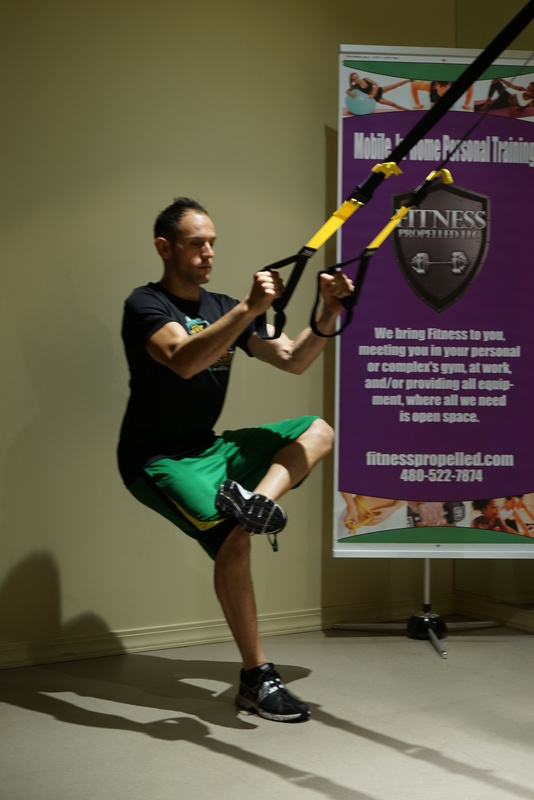 Born in the Navy SEALs, Suspension Training (#TRX) bodyweight exercise develops strength, balance, flexibility and core stability simultaneously. 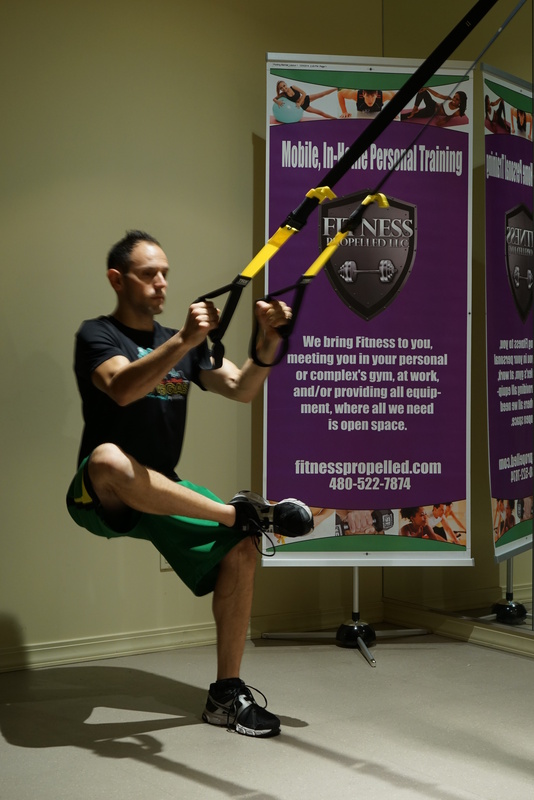 By utilizing your own bodyweight, the TRX Suspension Trainer provides greater performance and functionality than large exercise machines costing thousands of dollars, as it is all #Core all the time. 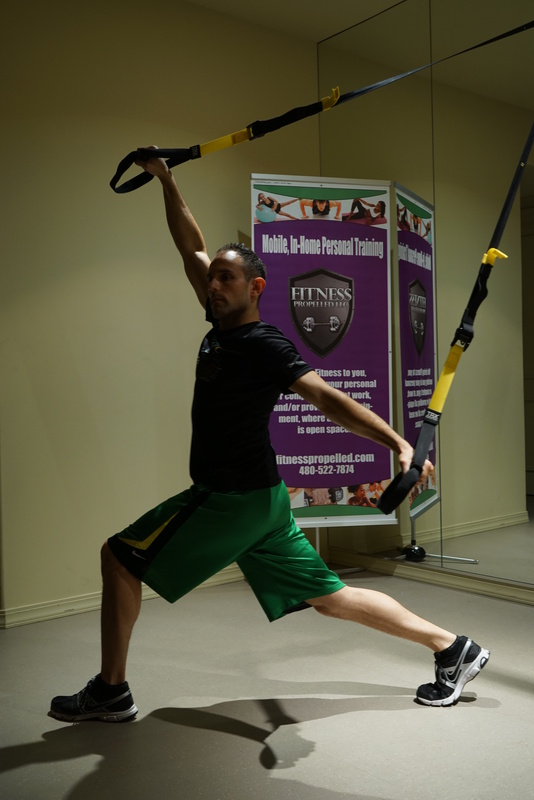 These 5 TRX stretches will change your outlook on stretching and not to mention, better prepare you for your workout. Stand tall facing away from the anchor point, feet placed shoulders width apart. Right leg steps forward and left hand reaches high toward the right as to create torso rotation. Hold for 20 seconds. Return to standing and then repeat with the left leg and right arm. 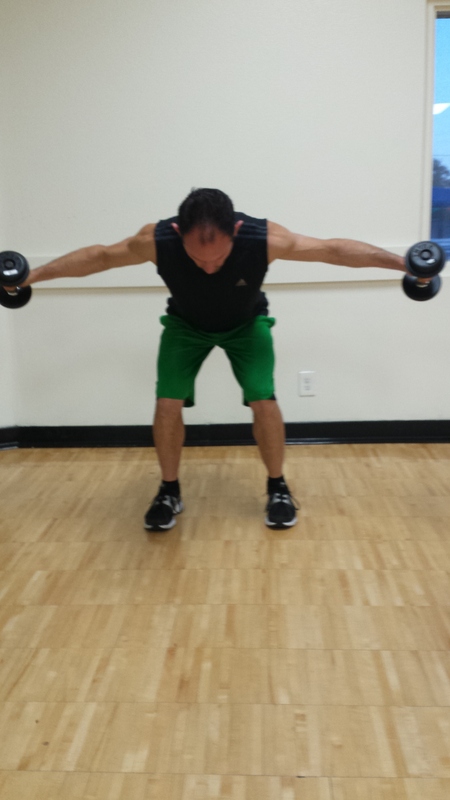 Stand tall shoulders width apart, shoulders pulled back, chest out and hands placed palms down on the handles. Depress and fall into your gluteus moving posteriorly as you create a hinge looking like a side laying V (>). Hold for 20 seconds. Return to standing. Stand tall, slightly wider than shoulders width apart, shoulders pulled back, chest out and hands placed palms down on the handles. Depress and fall forward to the anchor point hinging your lower back and torso, keeping the legs fully extended as to elongate the hamstrings and stretch the lower torso. Hold for 20 seconds. Return to standing. Place your right leg on-top of your left knee line then lower into a squat. Feel a moderate pull on your hip flexors. Hold for 20 seconds. Return to standing and repeat with left leg on-top of your right knee line. 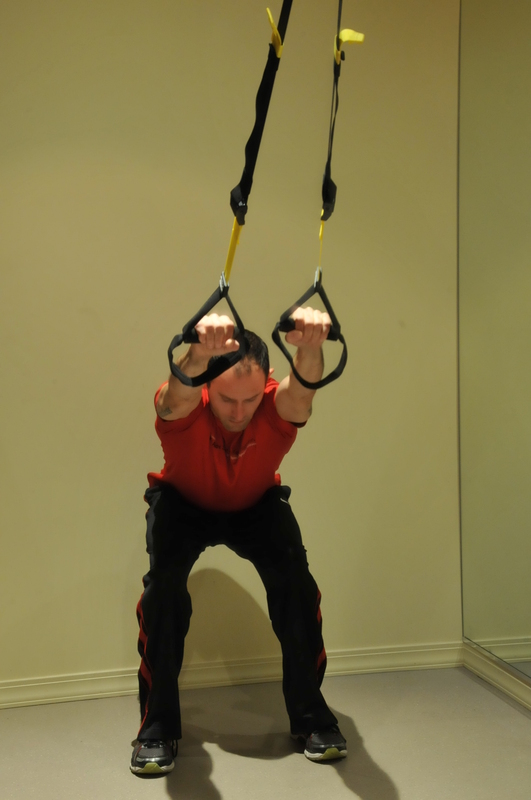 Stand facing besides the TRX strap. Be sure to check that your interlaced straps are secure. With your right hand placed on the strap slowly lower down through the upper trunk and hips as you allow your shoulder blades to retract and open up the shoulder. Hold for 20 seconds. Repeat with the left hand. This entry was posted in Clients, Exercise, Health, Health Tips, mens fitness, mens health, Stretching, Suspension Training, TRX, Wellness, womens fitness, womens health and tagged active, clients, exercise, fitness, Fitness propelled, health, health and fitness, health tips, mens health, stretching, Suspension Training, TRX, TRX Stretches, wellness, womens fitness on August 7, 2015 by FitnessPropelled. 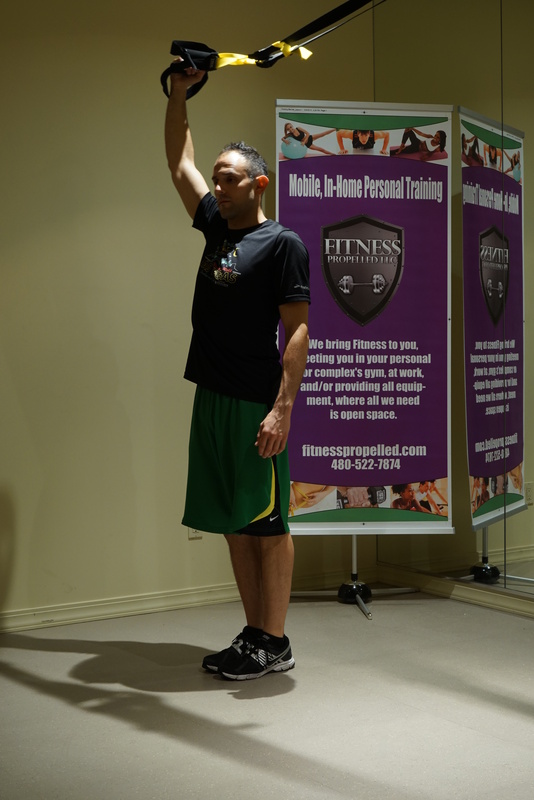 Over the course of my career in fitness, it has become obvious to me the benefits that come from using a personal trainer, especially when it is combined with a proper nutrition plan. Clients lose fat, look better, feel healthier and have increased energy. As you can see from testimonials page, my clients also see that benefit. While I see these benefits on a daily basis when working with clients, a recent study conducted by supplementcritique.com to gauge consumer perceptions of personal fitness trainers reinforces that. The study found that an overwhelming number of people are satisfied with their experience when they worked with a personal trainer. The survey, conducted in the United States, targeted consumers that currently workout at least three times a week. 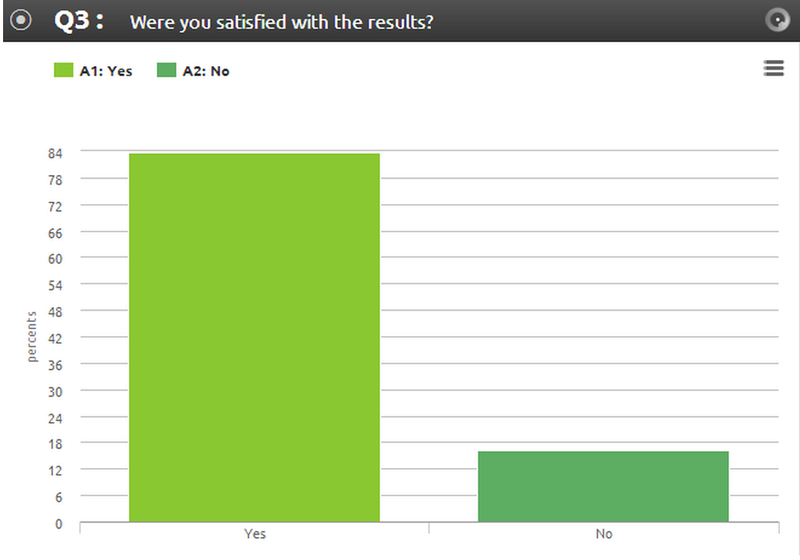 83% of people that have used a personal trainer were satisfied with the results. Of those surveyed, 56% of respondents who exercised three times or more per week stated that they had used the services of a personal trainer in the past. Of those that had used the services of a personal trainer as part of their workout regime, a whopping 83% were satisfied with the results, underlining the value that personal trainers bring to those looking to achieve their fitness goals. Of those respondents that had not used a personal trainer in the past, there was a clear understanding of the benefit of using a personal trainer as evidenced by the fact that 68% of respondents believed that working with a personal trainer would help them reach their fitness goals. 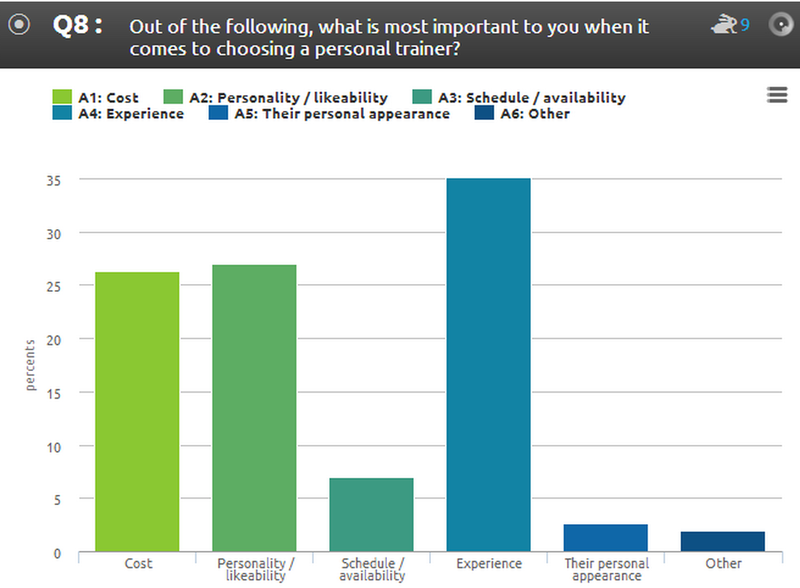 Consumers were asked what the most important factors they would consider when hiring a personal trainer. 35% of respondents said that the experience of the personal trainer was the most important factor followed by 27% of people saying that personality and likeability were most important. 26% of respondents cited cost as being the most important factor they would consider when choosing a trainer to work with. The study asked respondents what they thought was the education level of the average personal trainer. 61% of those surveyed believed that the average personal trainer has less than a college degree. 15% believed that the average education level was high school, while 46% believed that the average personal trainer had some college. 38% believed that the average personal trainer had obtained a college degree. I found this part of the study interesting as I have a B.S in Sports Management from ASU. What is striking about this study is the satisfaction level that people have when they work with a personal trainer. 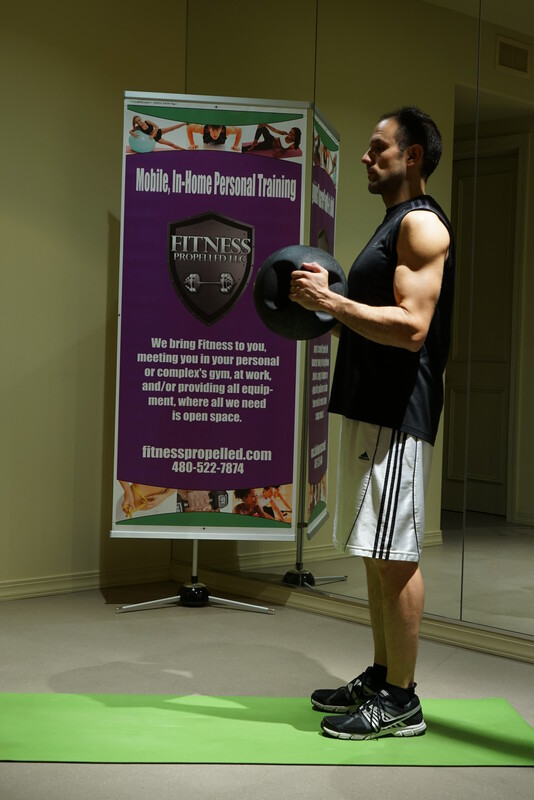 Working with a personal trainer that you can connect with is far more likely to lead to you having success while also increasing your enjoyment level. The study was conducted in April of 2015 in order to understand how personal trainers are perceived in the marketplace by consumers who make fitness a part of their daily lives. You can view the entire survey by clicking here. they address your individual needs not lump you into a “program”. 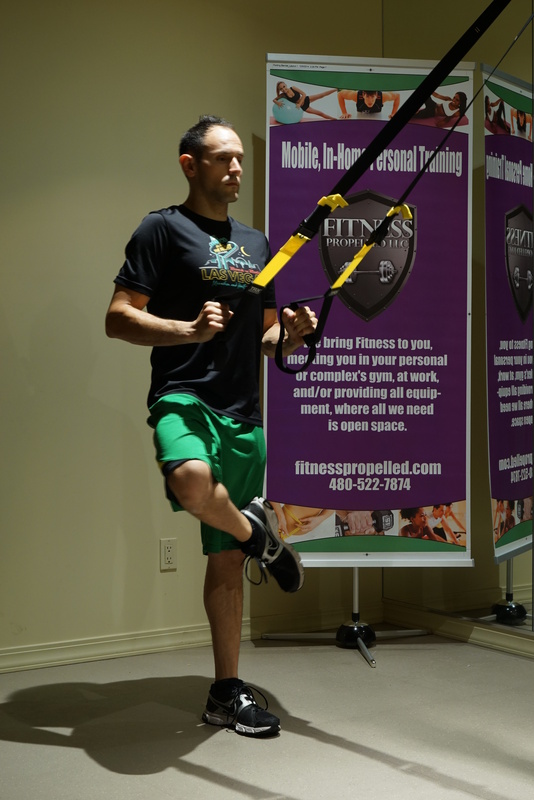 Visit www.fitnesspropelled.com or simply give us a call @ 480-522-7874 with any questions on getting started with your own training program. This entry was posted in Active, Clients, Cost, Exercise, fitness propelled, Fitness resources, Health, In-home personal training, mens fitness, mens health, Mobile personal training, Personal training, wellbeing, Wellness, womens fitness, womens health and tagged active, active lifestyles, activity, clients, commitment, education, fitness, fitness programs, fitnesspropelled, health, health and fitness, healthy lifestyles, hiring, mens health, personal training, wellbeing, wellness, womens fitness on July 22, 2015 by FitnessPropelled. 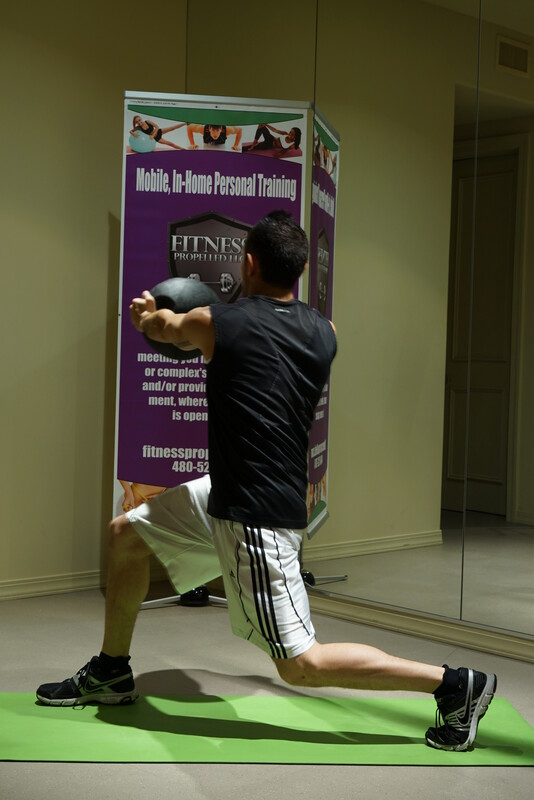 In our exploration of multiple pieces of equipment to use while adopting a more #Functional approach to training, medicine ball exercises are an excellent resource. Available in varying sizes and weights, these weighted spheres can help improve muscular power and sports performance. 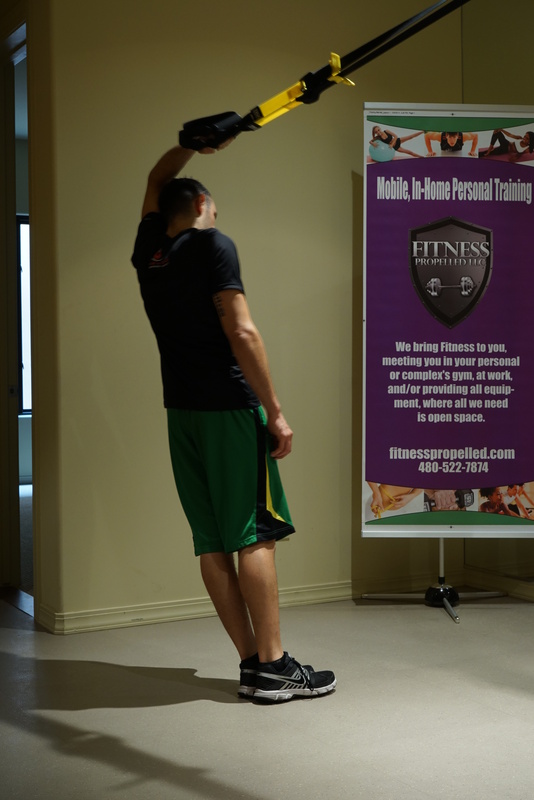 Medicine balls can be thrown and caught making for explosive movements that can improve overall athletic ability. When choosing the correct medicine ball weight, pick a ball that is heavy enough to slow the motion, but not so heavy that control, accuracy, or range of motion loose control. Set a goal of 10 to 15 reps—or as many as you can do with good form. 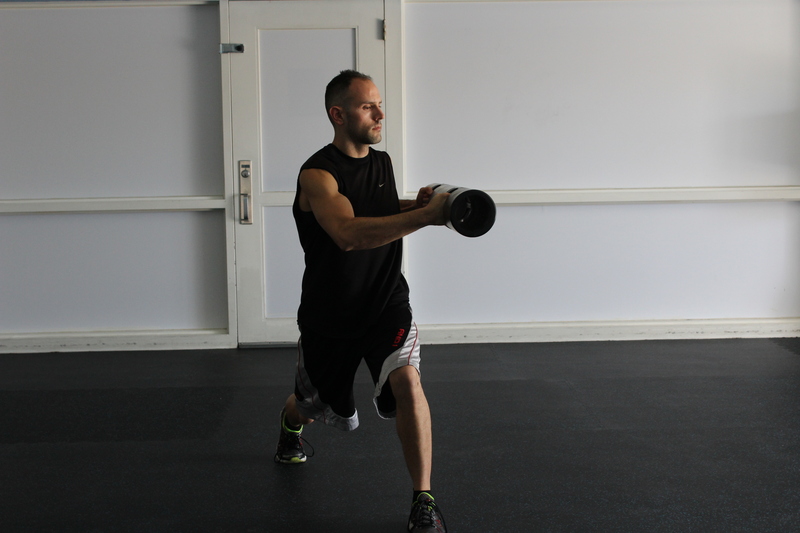 Below are @fitnesspropelled 6 total body #MedicineBall exercises. 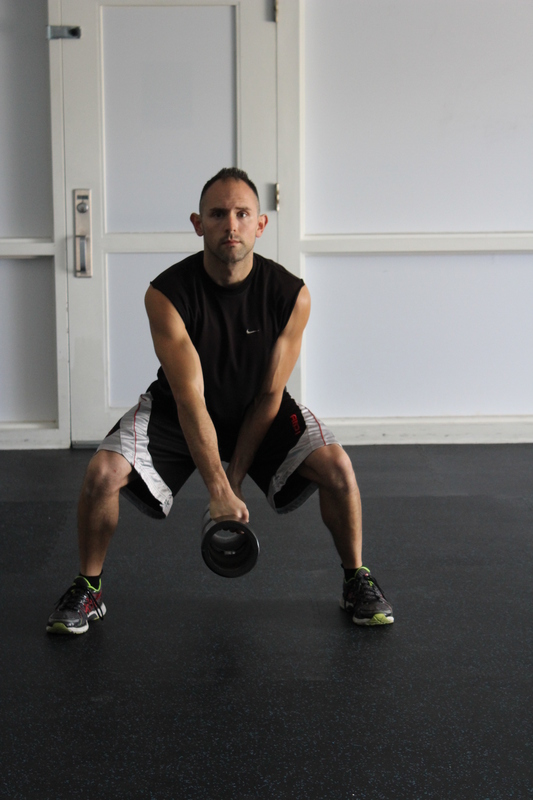 Stand with feet together shoulder width apart, holding a medicine ball in front of the chest in both hands. 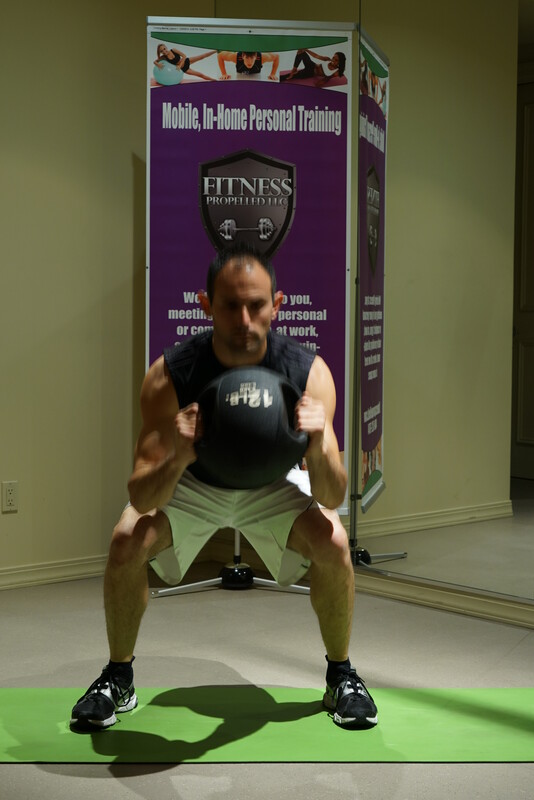 Lower down to a squat and on the return to a standing position reach the medicine ball straight overhead into a military press. Repeat. 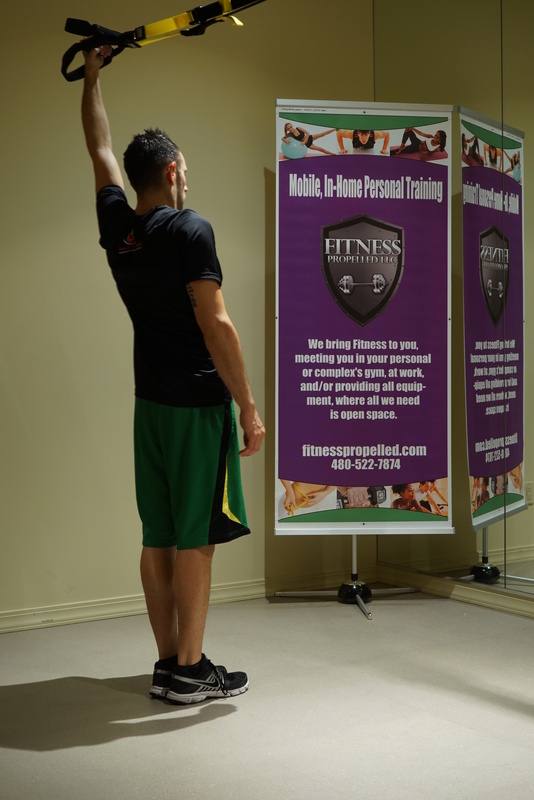 Engage your core, standing hip width apart with shoulders relaxed. 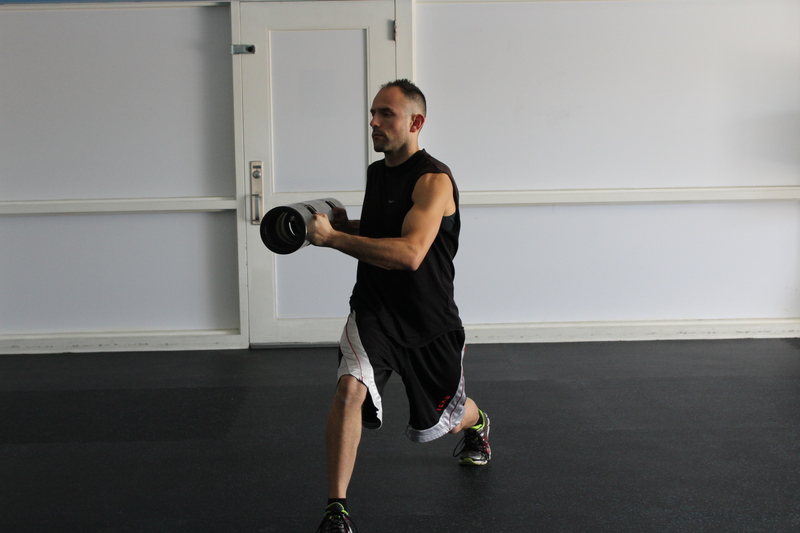 Holding a medicine ball a few inches in front of the chest, step forward into a lunge with the right leg. 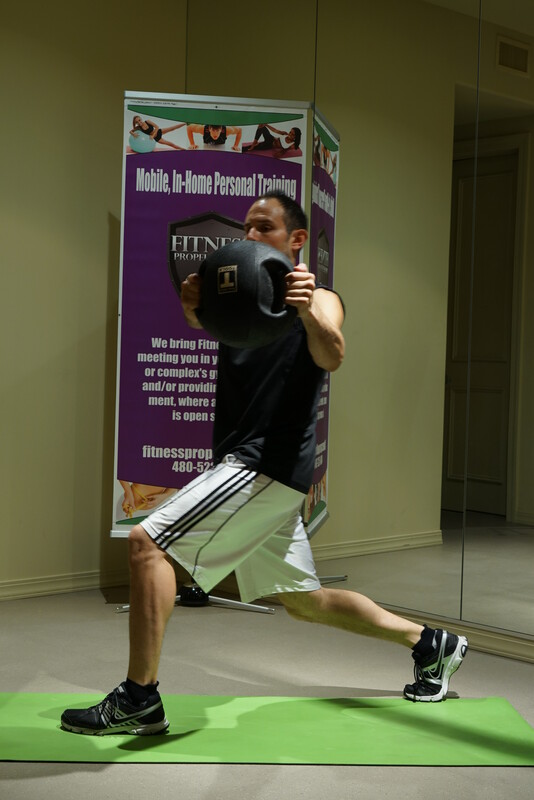 Extended arms, reach the medicine ball to the right, rotating the torso at the same time. Maintain the lunge and return to center. Come to standing, then lunge with the other leg (and rotate to the left this time). 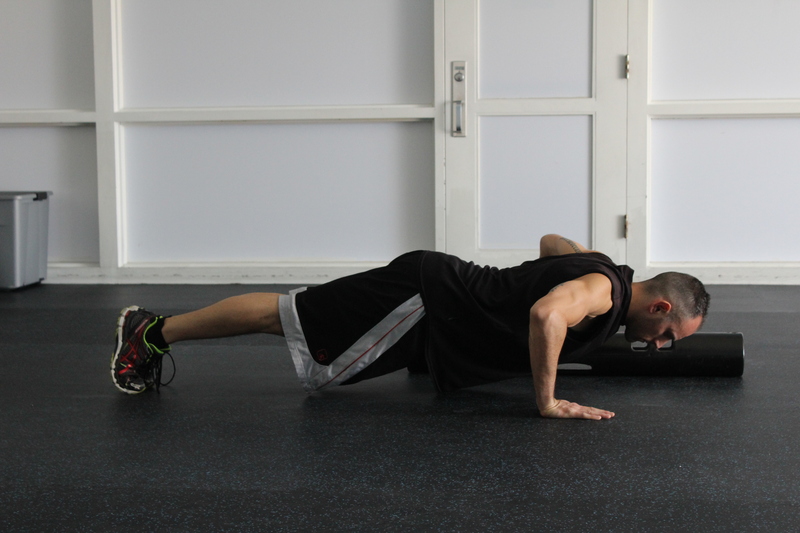 Start into #High-plank with a medicine ball under one hand, and lower the chest toward the floor to perform a push-up. 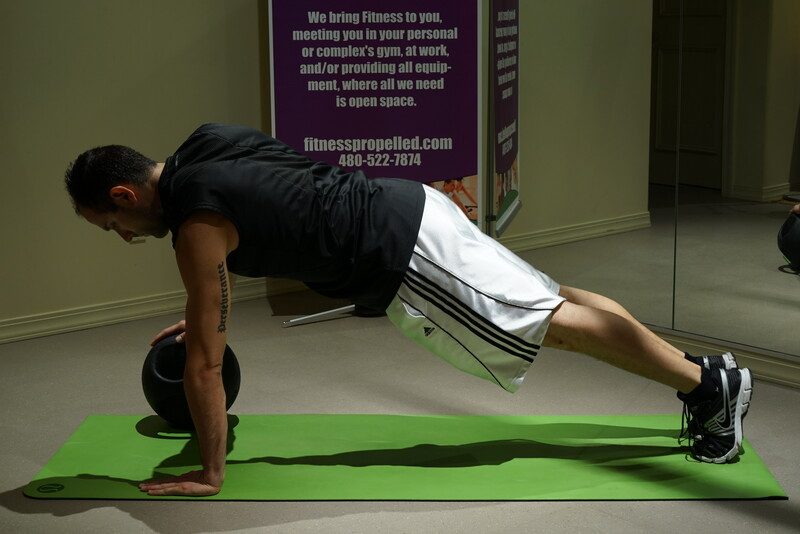 Return to #high-plank and roll the ball to the other hand. Repeat. Find the nearest med ball-safe wall. Stand about 3 to 4 feet in front of it, holding a medicine ball with both hands. Get into an athletic stance, with a slight bend in the knees, and the core engaged. Bring the ball to the chest, and firmly throw it at the wall and catch the ball on its return. Repeat at a steady, yet quick pace. Stand in a comfortable stance, with the core engaged. Hold a medicine ball in both hands with the arms extended overhead, inner arms grazing the ears Bend the elbows, lowering the ball behind the head until the arms form a 45-degree angle. Squeeze the triceps to straighten the arms, bringing the ball back to the starting position. Repeat. Sit on a gym mat holding a medicine ball in both hands. 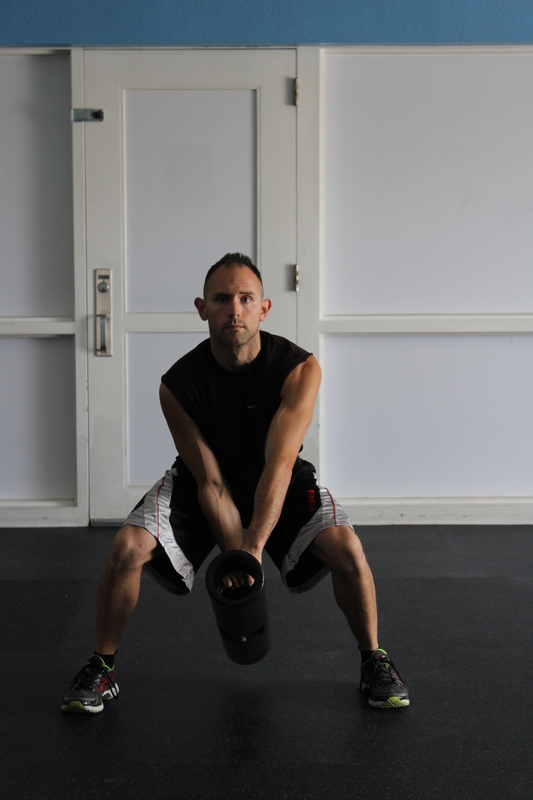 To start hold the medicine ball out in front of you with straight arms. Twist the torso to the left and then to the right, reaching and planting the medicine ball on the floor toward each hips side. Repeat. This entry was posted in Abdominal Exercises, athletic conditioning, Clients, Conditioning, core, core conditioning, Core Exercises, Exercise, exercises for women, Fitness, fitness propelled, Health, medicine ball, mens fitness, mens health, squats, Wellness, womens fitness, womens health and tagged Ab exercises, Abdomen, Abdomen exercises, ABS, active, active lifestyles, activity, athletic conditioning, clients, conditioning, core conditioning, exercise, exercise samples, exercises, exercises for women, extreme conditioning, fitness, Fitness propelled, ladies exercises, MedicineBall, mens health, womens fitness on June 4, 2015 by FitnessPropelled. With a flat platform on one side and a rubber dome on the other (resembling half an exercise ball), it can help you improve your balance and flexibility, sharpen your reflexes, and reshape your body. In the eighth video of our series of abdominal exercises on the #Bosu balance trainer, this video emphasizes the incorporation of supine stability exercises paired with an abdominal isotonic exercise . This entry was posted in abdomen, Abdominal Exercises, BOSU, bosu ball, Bosu Ball Exercises, Clients, core, core conditioning, Core Exercises, Exercise, exercises for women, Fitness, fitness propelled, mens fitness, mens health, six pack abs, womens fitness, womens health and tagged Ab exercises, Abdomen, Abdomen exercises, ABS, active, active lifestyles, activity, athletic conditioning, BOSU, bosu ball, clients, conditioning, core, core conditioning, core work, exercise, exercise samples, exercises, Exercsie, fitness, Fitness propelled, Stability on May 19, 2015 by FitnessPropelled. Exercising options and varieties have never been more full of options. Creating new and diversified exercise programs are becoming the norm as people are consistently seeking new ways to achieve their optimum levels of fitness. 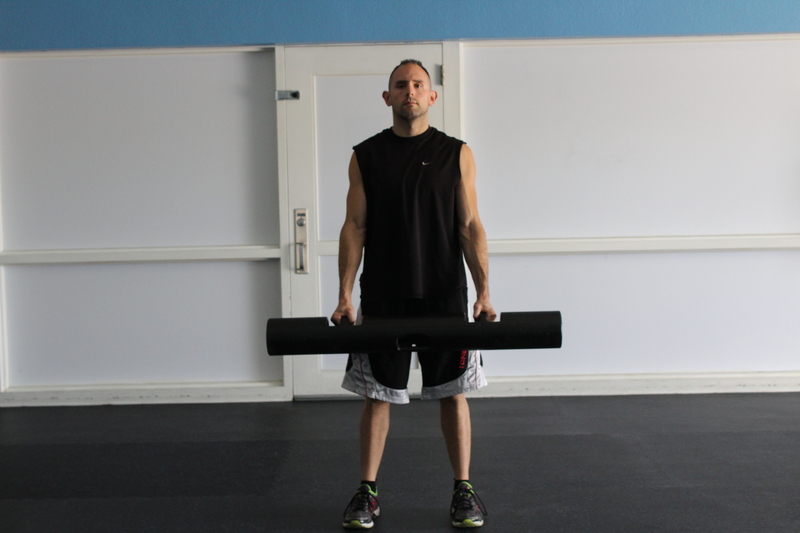 With all these options, comes exploration, so in this article let’s do a quick exploration on what #ViPR training is. #ViPR (“Vitality, performance and reconditioning”) is that rare thing: a seemingly faddy piece of equipment that actually works. 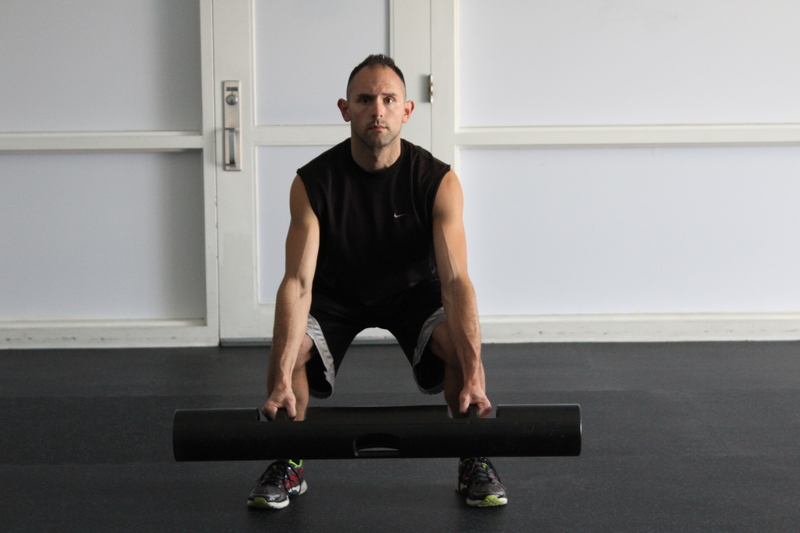 “With the #ViPR, every exercise can become a core exercise, a balance exercise and an agility exercise,”. 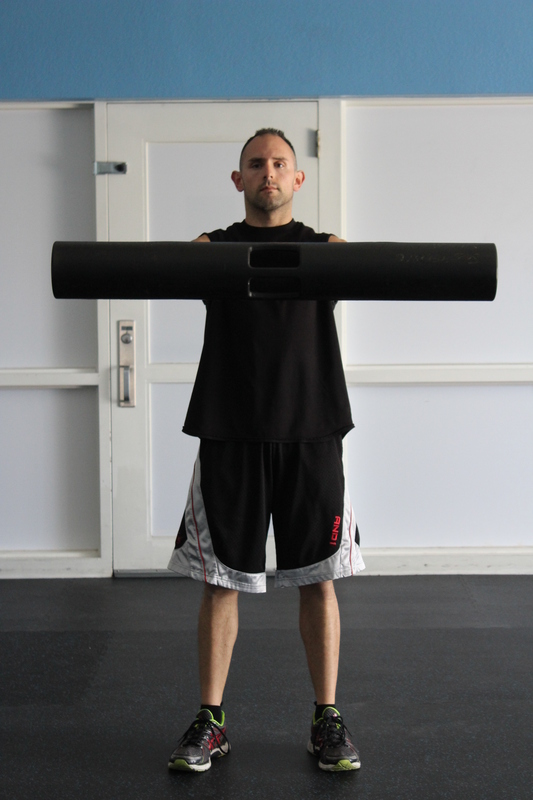 #ViPR is a round looking hollowed tube with two hand grips on one side and one long hand grip on the other. There are no attachments and it allows for optimum movement sequencing. 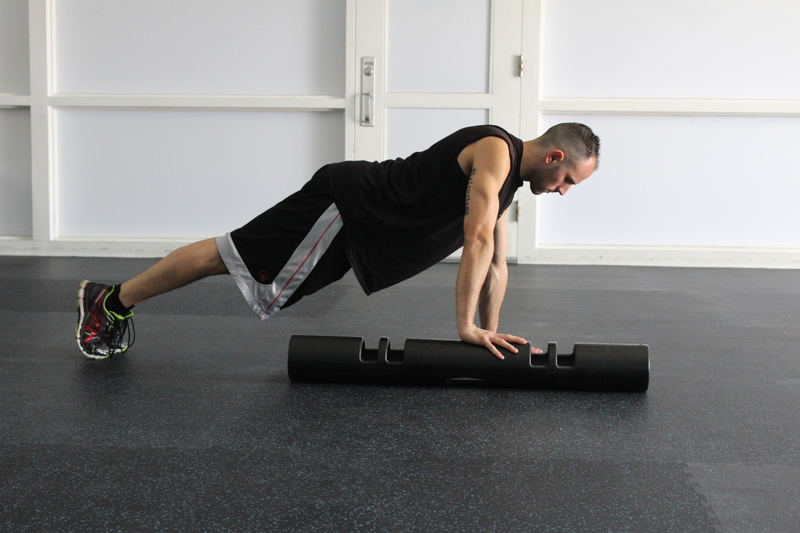 Below are Fitness Propelleds 5 #ViPR exercises to get you excited about including #ViPR training to your exercise regimen. 3 sets for 30 seconds per exercise with a 1 minute rest per set. 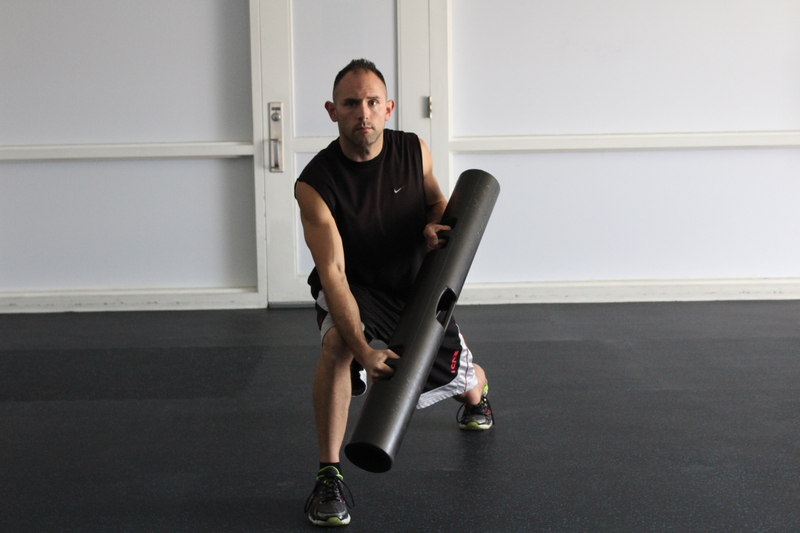 Holding the ViPR with a shovel grip horizontally in front of you, descend into a squat with the ViPR through your legs. 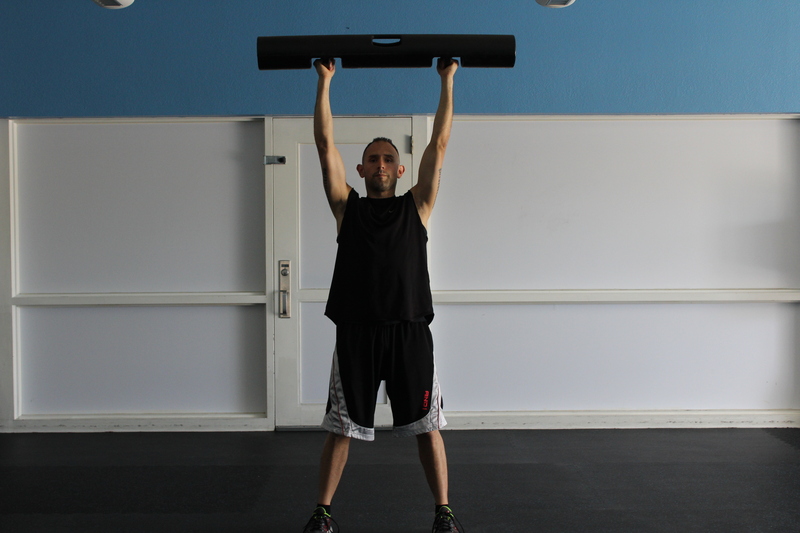 Then, stand and drive the ViPR vertically upward to the start point. Repeat. 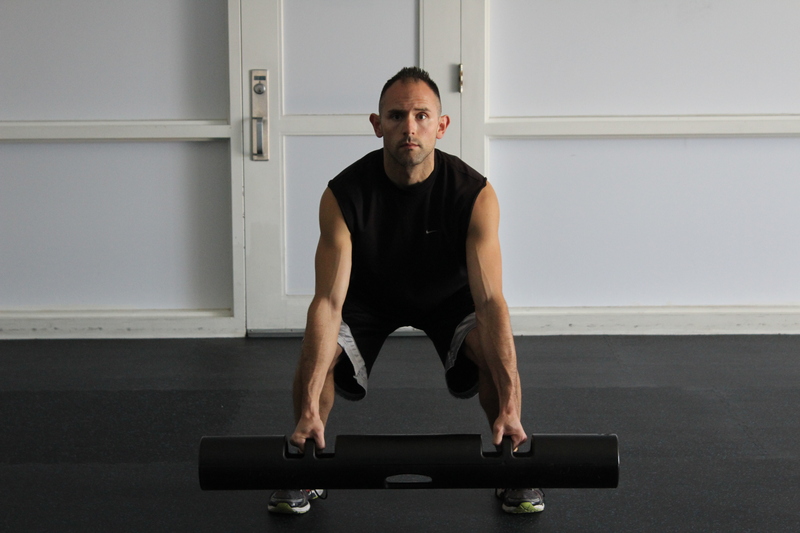 Holding the ViPR in a neutral grip, horizontally in front of you, descend into a full squat, lowering the ViPR to the floor. 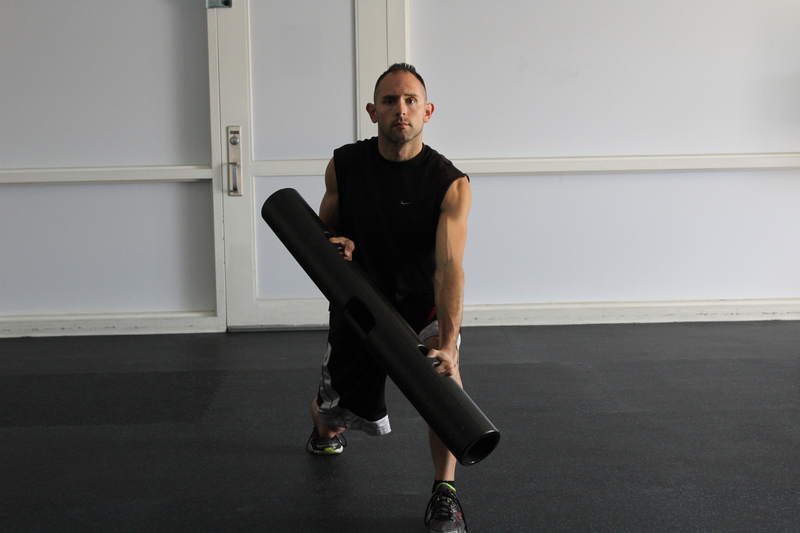 Stand up and step forward into a dynamic lunge, driving the ViPR forward on the same side. Return to standing and repeat the drive on the opposite side. With a shoulder-width overhand grip, bring your elbows forward so your palms are facing upward and the ViPR is resting on your front shoulder muscles. With a neutral spine, lower yourself as if sitting in a chair behind you. Keep your elbows high as you lower until your thighs are parallel to the floor. 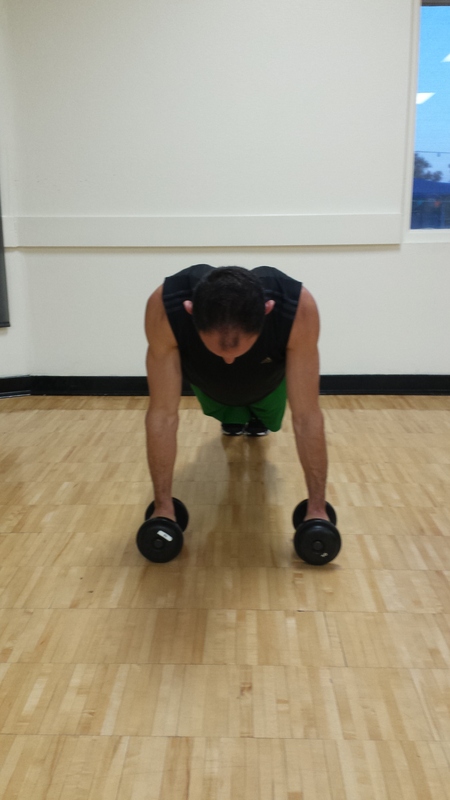 Pause then push back up to a standing position and perform an overhead shoulder press. Keeping your chest up high and back neutral, rotate your torso and then return to a upright split stance, repeating all reps on the same side before alternating legs. 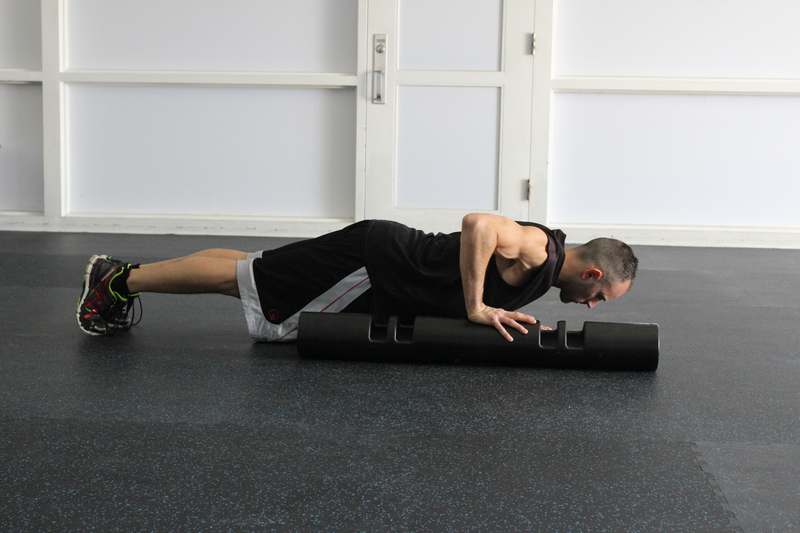 Laying the ViPR on the floor vertically, place one hand on the end of the cylinder and one on the floor while in the plank position. Make sure to place the hands under the shoulders. 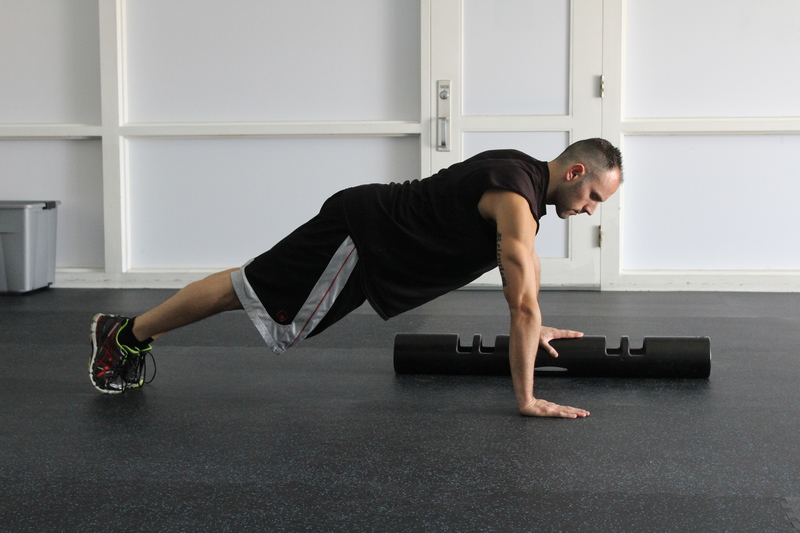 Roll the ViPR underneath the opposite hand, hold again in the plank position for 10 seconds and then do one (super slow) press-up. This entry was posted in athletic conditioning, Clients, Conditioning, Exercise, Fitness, fitness propelled, Fitness resources, Functional Exercise, Functional training, Health, Health Tips, mens fitness, mens health, ViPR, wellbeing, Wellness, womens fitness, womens health and tagged active, active lifestyles, activity, athletic conditioning, clients, commitment, conditioning, exercise, exercise samples, fitness, Fitness propelled, Functional exercise, Functional fitness, health, health and fitness, mens health, ViPR, weight training, wellness on May 5, 2015 by FitnessPropelled. The use of #dumbbells is a fantastic way to train one’s body. Dumbbells provide us with an ease of use, open options on ranges of motion and a thorough workout. 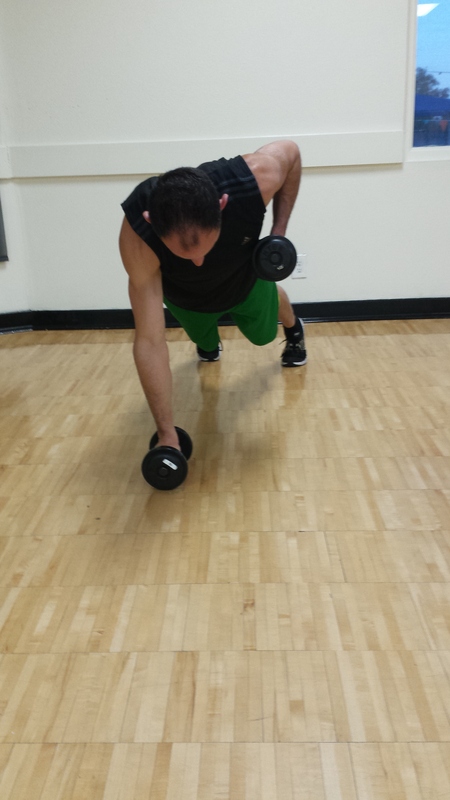 Dumbbell training puts us in positions to use our whole body and not become reliant on machines or circuit training. Using dumbbells engage the exerciser to connect with each exercise and focus on form, positioning and the development of strength. 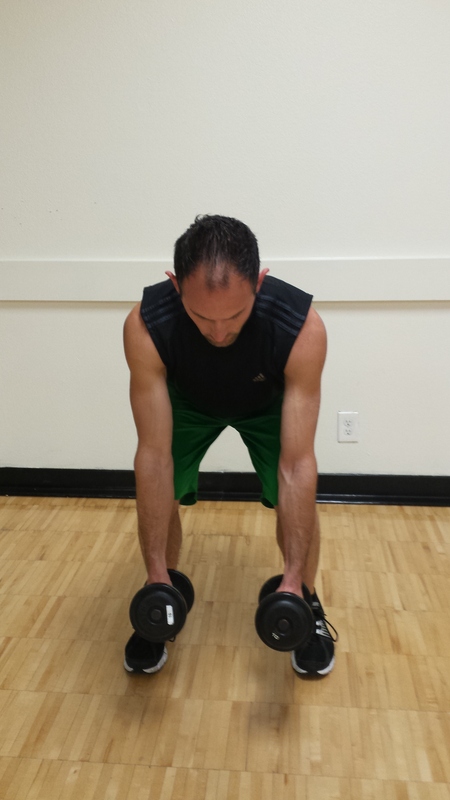 In this blog post, I share 5 dumbbell exercises that are sure to shape your “back”. Complete 3 sets with 15 repetitions of the 5 exercises listed below with 1:00 minute rest periods between sets. With a dumbbell in each hand (palms facing your torso), bend your knees slightly and bring your torso forward by bending at the waist; as you bend make sure to keep your back straight until it is almost parallel to the floor. 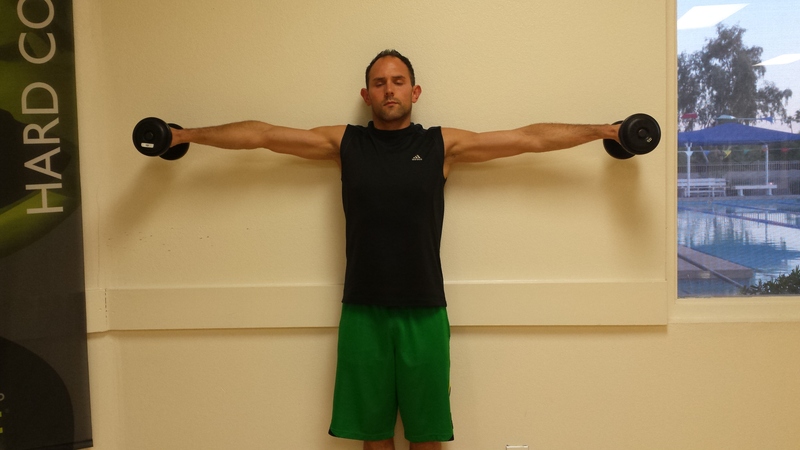 The weights should hang directly in front of you as your arms hang perpendicular to the floor and your torso. 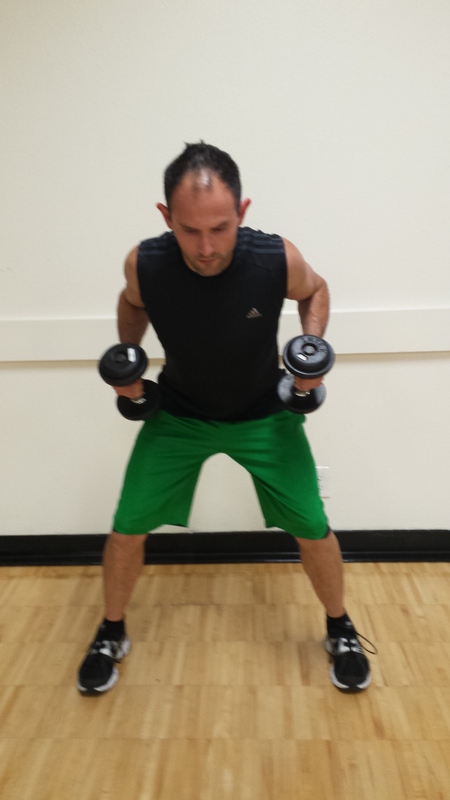 While keeping the torso stationary, lift the dumbbells to your side, keeping the elbows close to the body. At the top contracted position, squeeze the back muscles and hold for a second. Slowly lower the weight again to the starting position. Repeat. While keeping your back straight and maintaining the natural arch of your back, lean forward. 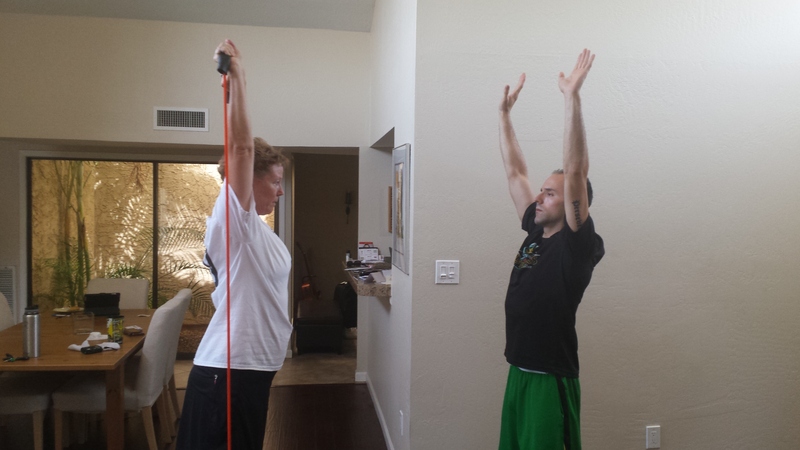 Let the arms hang in front of you perpendicular to the ground. The palms of your hands should be facing each other and your torso should be parallel to the floor. Keeping your torso forward and stationary, and the arms straight with a slight bend at the elbows, lift the dumbbells straight to the side until both arms are parallel to the floor. After a one second contraction at the top, slowly lower the dumbbells back to the starting position. Repeat. 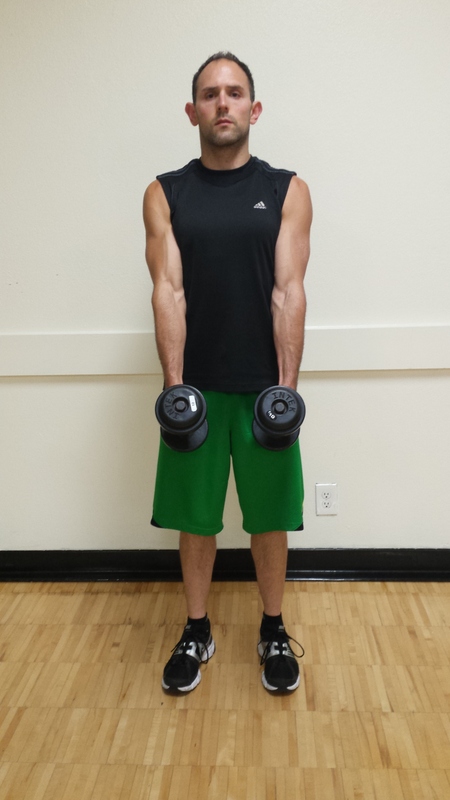 Place two dumbbells on the floor about shoulder width apart. Position yourself on your toes and your hands as though you were doing a pushup, with the body straight and extended. 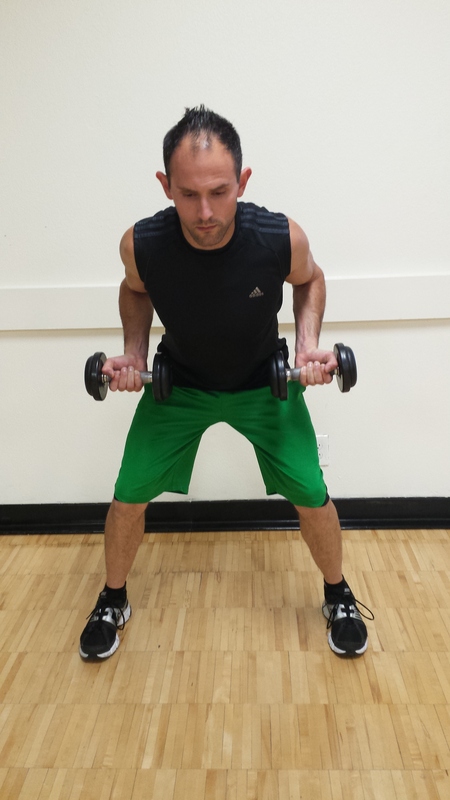 Use the handles of the dumbbells to support your upper body. You may need to position your feet wide for support. Push one dumbbell into the floor and row the other dumbbell, retracting the shoulder blade of the working side as you flex the elbow, pulling it to your side. 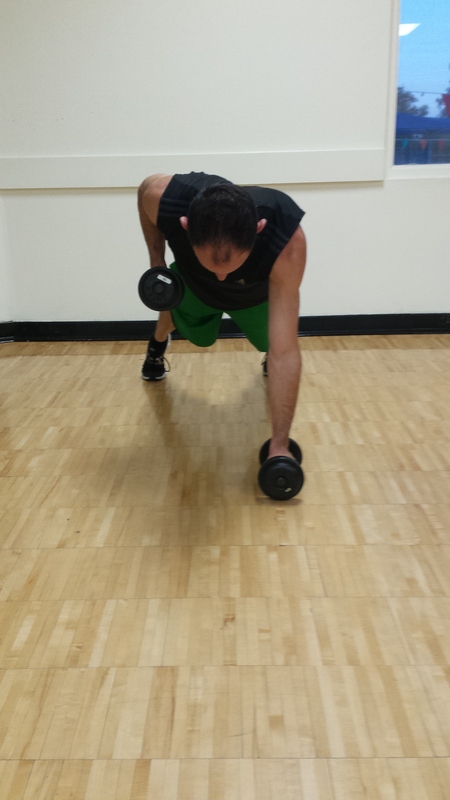 Then lower the dumbbell to the floor and begin the dumbbell row in the opposite hand. Repeat. With a dumbbell in each hand (palms facing away from your torso), bend your knees slightly and bring your torso forward by bending at the waist; as you bend make sure to keep your back straight until it is almost parallel to the floor. 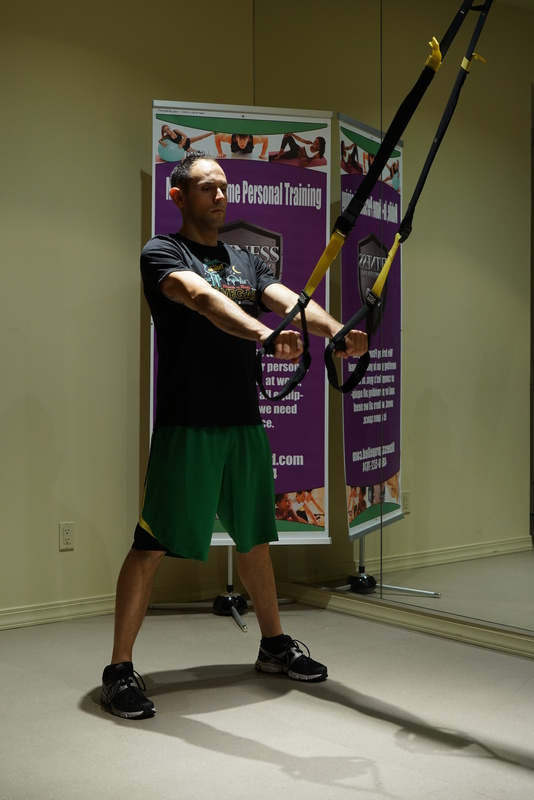 The weights should hang directly in front of you as your arms hang perpendicular to the floor and your torso. While keeping the torso stationary, lift the dumbbells to your with palms facing away, keeping the elbows close to the body. At the top contracted position, squeeze the back muscles and hold for a second. 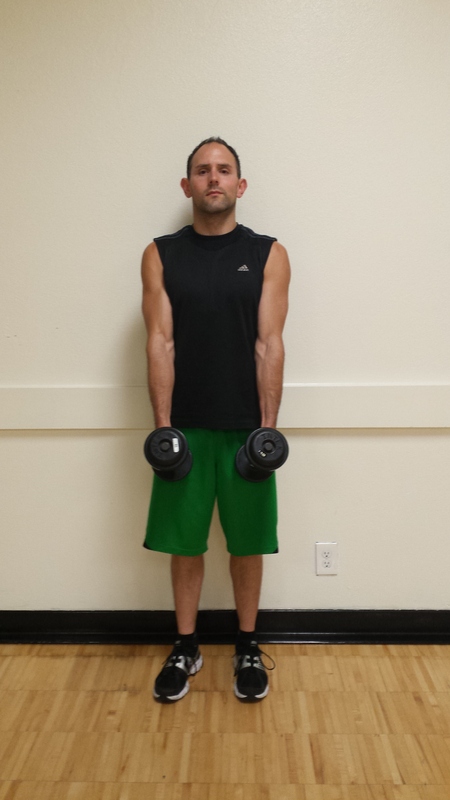 With your dumbbells stand with a straight torso and the dumbbells by your side at arms length with the palms of the hand facing you. While maintaining the torso in a stationary position lift the dumbbells to your side with a slight bend on the elbow and the hands slightly tilted forward. 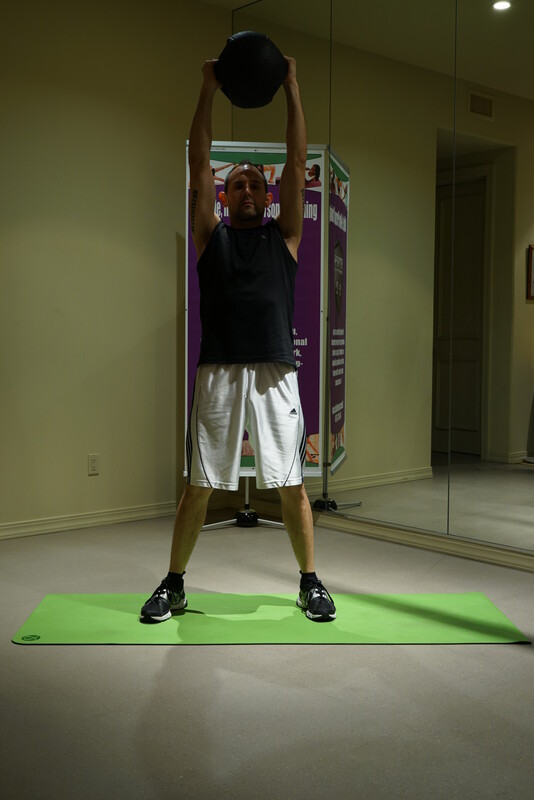 Continue to go up until your arms are parallel to the floor. This entry was posted in back exercises, Clients, Conditioning, dumbbell exercises, Exercise, exercise program, exercises for women, Fitness, fitness propelled, Fitness resources, Health, Health Tips, mens fitness, mens health, wellbeing, Wellness, womens fitness, womens health and tagged active, active lifestyles, activity, back exercises, clients, conditioning, dumbbell exercises, exercise, exercise samples, exercises, exercises for women, fitness, fitness exercises for women, Fitness propelled, health, health and fitness, healthy lifestyles, mens fitness, rows, wellness on April 17, 2015 by FitnessPropelled.